An area of rushing rivers, snowy mountain peaks and vast forests, the Shasta Cascade region draws visitors in for its natural wonders and historical attractions alike. More sparsely populated than most other parts of the state, Shasta Cascade is appealing mainly because of the opportunities for solitude, from state and national parks to recreation areas and national forests. Outdoor activities abound, from hiking, camping and horseback riding to fishing, boating and whitewater rafting. But there’s ways to enjoy city life and the company of others here too, from visitor-friendly cities like Redding and Chico to group activities like sightseeing and wine-tasting tours. Shasta Cascade’s craft breweries, as well as the Tehama Trail — a collection of farms, vineyards and agricultural areas linked together — provide plenty of opportunities for foodies and beer and wine aficionados to experience all that the temperate California climate has to offer. And from Whiskeytown to Oroville, Gold Rush history comes alive with museums, architectural gems and colorful festivals. Together, these different aspects show that the region is friendly to everyone from solo travelers to families to groups of friends looking for a good time. Best of all, it’s less-traveled than areas like the Central Coast or any of the major California cities — so chances are you won’t be running into too many crowds during your stay here. 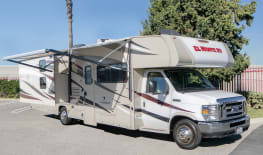 Plan a trip with a rental RV from Mighway, and let the journey unfold. Lava Beds National Monument is a land of turmoil, both geological and historical. Over the last half-million years, volcanic eruptions on the Medicine Lake shield volcano have created a rugged landscape dotted with diverse volcanic features. More than 700 caves, Native American rock art sites, historic battlefields and campsites, and a high desert wilderness experience await you! There is so much to do and see at the Lava Beds! The monument's two main attractions are Modoc War historical sites and lava tube caves. Throughout the summer we offer special events, ranging from Astronomy Day, Night Sky, and Jr. Ranger Day. There are over 22 developed caves and over, 700 discovered caves within Lava Beds National Monument. When caving we recommend that you wear appropriate safety gear including long sleeves, long pants, closed-toed shoes or boots, gloves, kneepads and helmets. The Headquarters Building at Lassen Volcanic National Park was built in 1928 in an adapted National Park Service Rustic style. The building served not only as the administration building but as a visitor center, and it quickly became too small for the developing park's needs. It was remodeled three times during its first eleven years. In 1932, the west wing was expanded with an addition that included men's and women's bathrooms and an enlargement to the superintendent's office. A back porch was added in 1935 to protect the doorways and windows from snow and to provide storage space for furnace wood. The park's Developmental Outline for 1938 states that due to development in the park, the building was not large enough, adding "[m]oreover, the present building does not have sufficient storage space, is hard to keep warm in winter, and presents a bleak and unattractive aspect on the outside which gives all park visitors coming by the Headquarters Area a very bad first impression of the park." The park proposed moving the present building elsewhere on the site and converting it to housing, and building a new Administration and Visitor Center Building. Funding was not available for a new building so from 1939 through 1940 the building received a major renovation with the addition of an east wing, which also included an addition to the basement. This work was done according to drawings LV-NP 3004 C & D, designed by G. W. Norgard of the Branch of Plans and Designs, and was a Civilian Conservation Corps construction project. At that time, an engineer's office was added to the second floor, the stairs were reconfigured, a clerk's office was added to the first floor and the Assistant Superintendent's office was expanded. The new east wing had a wood shingled dormer on the south side, and a similar dormer was added to the west wing and the eave extended. The front entrance porch in the north wing was enclosed to expand the lobby and a new stone porch was added to its east side. Stone veneer was applied below the windows on the front and on the exposed concrete foundations. A wood flagpole in a stone base and a stone water fountain were installed on the front lawn. Scheduled for completion in Summer 2004, this unusually designed bridge, functioning as a sundial at one end and conveying a sense of weightlessness, connects the north and south campuses of Turtle Bay Exploration Park. Bidwell Mansion State Historic Park is a beautiful, three-story, 26 room Victorian House Museum that stands as a memorial to John and Annie Bidwell. John Bidwell was known throughout California and across the nation as an important pioneer, farmer, soldier, statesman, politician and philanthropist. Annie Ellicott Kennedy Bidwell, the daughter of a socially prominent, high ranking Washington official, was deeply religious, and committed to a number of moral and social causes. Annie was very active in the suffrage and prohibition movements. The Bidwells were married April 16, 1868 in Washington, D.C. with then President Andrew Johnson and future President Ulysses S. Grant among the guests. Upon arrival in Chico, the Bidwells used the Mansion extensively for entertainment of friends. Some of the guests that visited Bidwell Mansion were President Rutherford B. Hayes, General William T. Sherman, Susan B. Anthony, Frances Willard, Governor Stanford, John Muir, and Asa Gray. When constructed, Bidwell Mansion featured the most modern plumbing, gas lighting and water systems. The overall style of the three-story brick structure is that of an Italian Villa, an informal, warmly romantic style. The building's exterior is finished with a pink tinted plaster. The park is within the Cascade Range and Modoc Plateau natural region, with forest and five miles of streamside and lake shoreline, including a portion of Lake Britton. The park's centerpiece is the 129-foot Burney Falls, which is not the highest or largest waterfall in the state, but possibly the most beautiful. Additional water comes from springs, joining to create a mist-filled basin. Burney Creek originates from the park's underground springs and flows to Lake Britton, getting larger along the way to the majestic falls. The park's landscape was created by volcanic activity as well as erosion from weather and streams. This volcanic region is surrounded by mountain peaks and is covered by black volcanic rock, or basalt. Created over a million years ago, the layered, porous basalt retains rainwater and snow melt, which forms a large underground reservoir. Within the park, the water emerges as springs at and above Burney Falls, where it flows at 100 million gallons every day. Burney Falls was named after pioneer settler Samuel Burney who lived in the area in the 1850s. The McArthurs were pioneer settlers who arrived in the late 1800s. Descendants were responsible for saving the waterfall and nearby land from development. They bought the property and gave it to the state as a gift in the 1920s. Parking aprons have an average length of 16 feet. 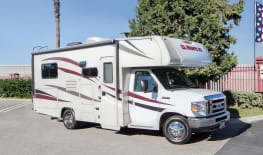 Madrone Campground is located in the Shasta-Trinity National Forest on the banks of a small creek. Dense vegetation provides shade for the campsites, which offer an excellent view of the natural beauty surrounding the campground. Be sure to take your time and enjoy yourself at this campground, but always remember to store food properly; otherwise you might run into a bear (or even a mountain lion if you're living right). Elevation: 1,500 feet!